The Sprayberry High School Band would like to invite your high school and 8th grade percussionist to join us at our 2019 Drumline Clinics. The clinics are open to any percussionist or double reed player that is zoned to attend Sprayberry High School in the Fall of 2019. The drumline clinics are weekly sessions held in the Sprayberry Band room for all percussionists that desire to participate in the Sprayberry “Band of Gold” Marching Band this Fall. The clinics are taught by our experienced percussion staff led by our percussion director Mr. Alan Sears. Students will have the opportunity to try out all of the marching band percussion instruments over two months in preparation for our drumline and front ensemble auditions on Thursday, March 28th. These instruments include: Marching Snare Drum, Marching Tenor Drums, Marching Bass Drum and all front ensemble instruments. Front ensemble includes all keyboard instruments (Marimba, Vibraphone, Xylophone, Bells) as well as multi-percussion and electronics. During the clinics the students will have the opportunity to try out all of the instruments before auditions. Typically students find the instrument that is best for them at this point in time. Students are encouraged to audition for more than one instrument in the drumline. All Students will be placed on the drumline in some capacity, however, only the students that meet the performance standards will be placed on a drum or keyboard. An explanation of the audition process and requirements will be given at the clinics. 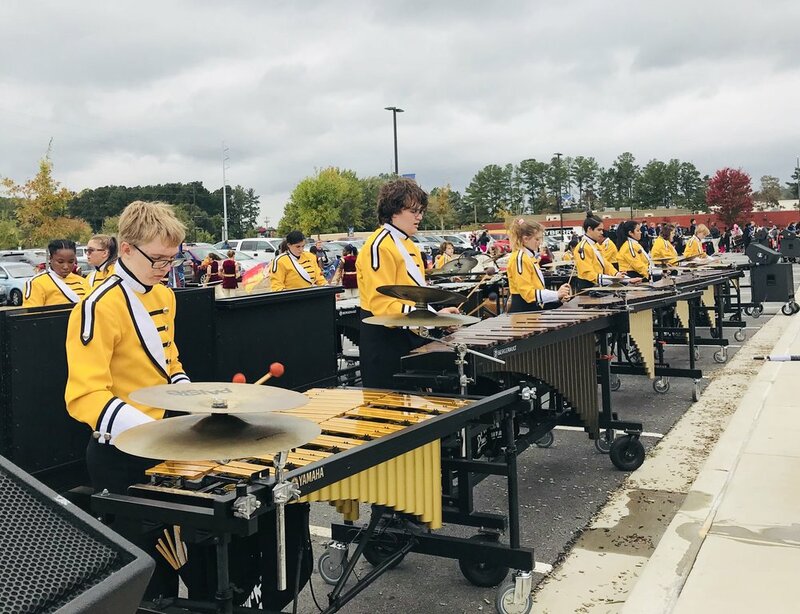 -The clinics are not required but are strongly encouraged if your student is planning to be a part of the Sprayberry Band of Gold percussion section. All percussion students attending J.J. Daniell, Simpson and McCleskey Middle Schools are invited to our weekly drumline clinics at Sprayberry High School. The drumline clinics are designed to introduce students to the instruments and the performance techniques of marching percussion. Clinics will lead into the first round auditions for the 2018 Sprayberry High School Drumline! Clinics will be taught by the Band of Gold percussion staff and Percussion Director Alan Sears. (It’s suggested the students have a pair of MARCHING snare sticks for practice but they are not required) We will provide mallets and instruments for the students to use during the clinics.